Lonnie Knight has been part of the Minnesota music scene since the Surfin’ Bird first flew our skies: Multiple Minnesota Music Awards winner; member of Jokers Wild and the Hoopsnakes (among other bands); session player and record producer; singer-songwriter. Tonight, he is solo-guy-with-guitar, and you won’t be able to take your ears off him. 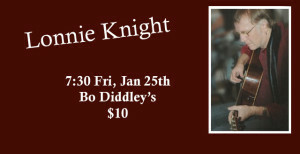 This is part of the Five & Dime Series and so we do not sell tickets in advance. We do not take reservations—at Bo’s – and do not set tickets aside without payment.